Thelma Mae Robbins, age 93 of Hillsboro, Ohio passed away peacefully at Hearth and Care Rehabilitation and Nursing Center Thursday morning. Thelma is survived by her children Patricia (Carey) Michael and Deborah Robbins, Grandchildren Brian (Cindy) Michael and Chris (Michele) Michael, Great Grandchildren Joshua (Monique) Michael, Courtney Michael, Spencer Michael, Seth (Kia) Michael, and Allison (Nick) Sowders, Great-Great Grandchildren Bennett Michael, Kenton Michael, Gabriel Michael, Elijah Michael, and Jack Sowders, sister Anne Credit as well as sister-in-law Dwendolyn Beatty. Thelma is preceded in death by her parents John Elmer and Leota (Woolums) Beatty, husband Joseph Robbins (married March 1, 1946) and brothers Elmer Beatty Jr. and Charles Beatty. Special friends include Vicki Couch; and David, Terri, and Michelle Murphy. Funeral Service will be 2:00 PM Sunday November 25, 2018 at the Thompson Funeral Home. Burial will follow at the Prospect Cemetery. Friends may visit from 12:00 PM until time of service on Sunday at the Thompson Funeral Home. Telling the story of someone’s life in mere sentences is always a difficult task. 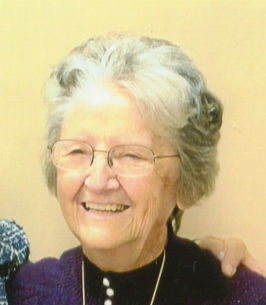 Individuals close to Thelma will always remember her iconic smile and her witty sense of humor. Though her battle with Alzheimer’s ultimately impaired her memory and her physical abilities, those of us who were close to her will remember her genuine love for her family and animals. For the better part of her adult life, Thelma milked cows on her daughter and son-in-law’s farm and, when she decided to retire, turned to her lifetime love of horses. She loved horses and could be found feeding her two horses twice per day, well into her 80’s. Though her physical abilities were failing, she remained outdoors for most of her day. Her door was never locked, and she would be awake late into the night, welcoming anyone who wanted to visit. It was nearly impossible to leave her living room without first enjoying a glass of sweet tea and a smile on your face from her quiet sense of humor. They say dying is more of an affair of the people left behind than your own. I’m not sure if that’s true or not but I think we can all agree that Thelma will be greatly, greatly missed. To send flowers to the family of Thelma Mae Robbins, please visit our Heartfelt Sympathies Store. We encourage you to share any memorable photos or stories about Thelma. All tributes placed on and purchased through this memorial website will remain on in perpetuity for future generations. Debbie and family, please accept our deepest sympathy for the loss of your mother. It has been our great privilege to have known Thelma. We always felt very welcome and loved whenever we went to visit. May the family find comfort in knowing she has found peace after her long illness. We send our prayers and love. Godspeed Thelma.